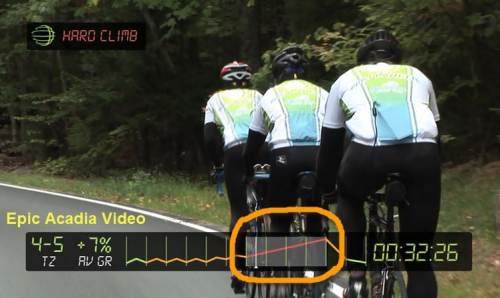 Epic Planet’s video Epic Acadia is perfect for Threshold based training. The first 30 minutes are a perfect warm up with a number of short climbs I use to bring them to Threshold before we got to the climb. The graphical representation of where you are during the class is the best of any of the DVD creators that I have experienced. If you are planning a field test this maybe the perfect video to use. Can you handle a 20 minute climbing segment?